The Andromeda Galaxy is surrounded by a swarm of small satellite galaxies. 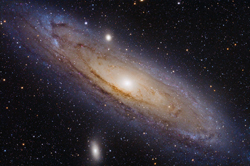 Led by the Dark Cosmology Centre astrophysist, Nicola C. Amorisco, a team of researchers have detected a stream of stars in one of the Andromeda Galaxy’s outer satellite galaxies, a dwarf galaxy called Andromeda II. The movement of the stars tells us that what we are observing is the remnant of a merger between two dwarf galaxies. Mergers between galaxies of such low mass has not been observed before. The results are published in the scientific journal, Nature. The Andromeda Galaxy is a large spiral galaxy like our galaxy, the Milky Way. It is located about 2.3 million light years away and can be seen with the naked eye. The galaxies in the early universe started off small and the theory of the astronomers is that the baby galaxies gradually grew larger and more massive by constantly colliding with neighbouring galaxies to form new, larger galaxies. Large, massive galaxies constantly attract smaller galaxies due to gravity and they eventually merge together and grow even larger. But not all of the small galaxies are being ’eaten’ by the large galaxies. Some of them remain in an orbit around the large galaxy. The largest galaxy in our cosmic neighbourhood is the Andromeda Galaxy, which is about 2.3 million light years away. Like our own galaxy, the Milky Way, Andromeda is a large spiral galaxy. 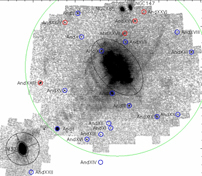 The map shows the Andromeda Galaxy and all the small surrounding satellite galaxies. The satellite galaxy Andromeda II is located in a distant orbit approx. 600,000 light years from the centre of the great Andromeda Galaxy. Andromeda is surrounded by a swarm of small galaxies – astronomers have counted more than 20. They have names like Andromeda I, II, III, IV...etc. Researchers from the Dark Cosmology Centre at the Niels Bohr Institute, among others, have analysed measurements of the stars in the dwarf galaxy Andromeda II and made a surprising discovery. ”Stars in a dwarf galaxy often move around at random, but this is not exactly the case for Andromeda II. In particular we could see that a stream of stars is moving around differently than the rest in a very coherent way. These stars are situated in an almost complete ring and are rotating around the centre of the galaxy,” explains DARK Fellow, Nicola C. Amorisco, Dark Cosmology Centre, Niels Bohr Institute, University of Copenhagen. The dwarf galaxy Andromeda II is very small – less than one percent of the Milky Way. The rotating stream of stars in the galaxy is entirely made up of old stars and from their properties, researchers can draw conclusions about this dramatic cosmic event. 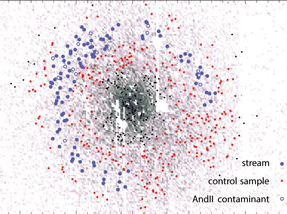 The diagram shows the dwarf galaxy Andromeda II with the stars belonging to the stream marked in blue. Their movement show that Andromeda II is a merger of two dwarf galaxies. ”What we are seeing is the remains of a collision between two dwarf galaxies, which had a dramatic effect on the dynamics of the remnant,” says Nicola C. Amorisco. He explains that mergers between such small galaxies are expected during the galaxy formation process, but are rare at present times and had hitherto not been seen. Andromeda II is the least massive known example of merging of galaxies so far and illustrates the scale-free character og the formation og galaxies down to the lowest galactic mass scales.